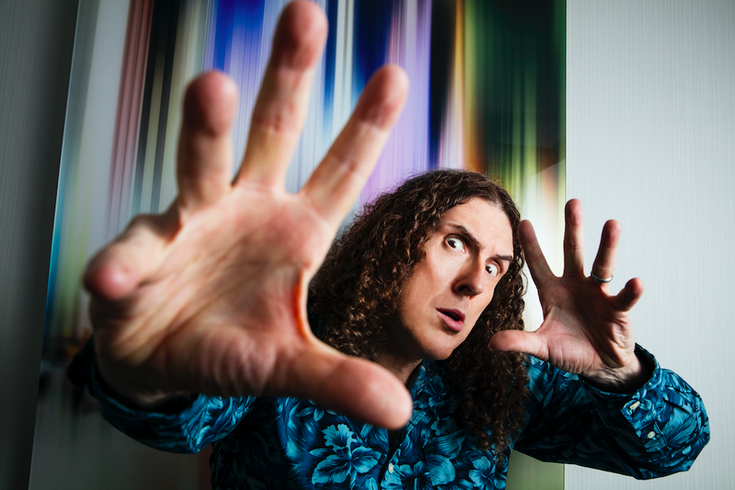 Weird Al Yankovic appears Friday, March 16 at Caesars Atlantic City. When Weird Al Yankovic started crafting song parodies during the late ‘70s, he never envisioned that it would lead to a career. However, Yankovic has four Grammys and a massive canon of parodies, including mock-ups of tracks of Nirvana, Madonna and Michael Jackson, among other icons as well as one-hit wonders. Yankovic, 58, who performs tonight at Caesars Atlantic City, details what it was like to to work with Lin-Manuel Miranda on the “Hamilton Polka,” whether or not he will ever consider crafting a conventional song, and what recording artist had issues with one of his tunes. A: [Miranda] and I have been friends for several years. He asked if I would have interest in doing a “Hamilton” parody, and I said, ‘sure.’ We made it fun and relevant. Q: Are you surprised how long you’ve been at it since you never expected to have a career writing and recording parodies? A: I’m mystified. It feels kind of surreal. This wasn’t supposed to happen. I was supposed to be a footnote in pop culture history. I wasn’t supposed to be someone with a 35-year recording career. I’m fortunate people still care." Q: Writing a song parody is more difficult than people think, correct? A: People sometimes denigrate parodies, but they’re not easy to do well. Anybody can goof on a song. There are so many people who do it on YouTube, but to do it in a clever way and sustain that for three and a half minutes is not easy. Q: Dave Grohl once said that he didn’t make it until he was parodied by you. How many people have said just that? A: I hear that often. Kurt Cobain said that he didn’t make it until I did my parody. When I did Nirvana’s “Smells Like Teen Spirit,” Kurt asked if it was going to be about food since I was doing a lot of food parodies back then. I told him it was going to be about how nobody can understand what he’s singing and he said, "That’s funny." Kurt was a good sport and an incredibly cool guy. Q: Who had issues with your parodies? A: Since I ask permission before I do a parody, I’m typically good with everyone. However, Coolio was upset about my parody of “Gangsta Paradise” with “Amish Paradise.” But that’s water under the bridge now. But before that worked itself out, Coolio and I were on a flight back then and I don’t like confrontation so I hid behind a newspaper during the entire flight since we were both in first class. But it’s all good now between us. Q: How many recording artists have said, "Hey, when are you going to parody one of my songs?" A: I’ve had people say just that. I just tell them, "Take a number and we’ll get to it." Q: What’s your favorite song you’ve parodied? A: Probably “White and Nerdy.” Chamillionaire loved my parody of “Ridin." He came up to me during the Grammys and said that my parody was the reason "Ridin” was so huge. I favor “White and Nerdy” since I came up with a lot of it through personal experience. Q: Were you surprised Donny Osmond was so animated during the “White and Nerdy” video? A: You never know what you’ll get from a celebrity when you ask them to do a video. They might phone it in but Donny went beyond 100 percent. Q: Did you ever consider writing and recording conventional songs? A: No. I know some people will write a novelty song and then they’ll say, "Here’s my real music." Not me. I have no desire to make serious music. Weird Al Yankovic appears Friday, March 16 at Caesars Atlantic City, 2100 Pacific Ave., Emo Phillips will open. Tickets are $49.15 and $100. Show time is 9 p.m.